Yesterday, the jury in the Jodi Arias murder trial failed to reach a decision regarding her sentence (whether she would receive life or death). The hung jury means a mistrial and then a retrial with a new jury beginning July 18th. 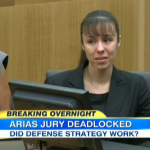 Both Arias and the prosecutors seemed stunned by the result. Today, Dan stopped by Good Morning America to discuss how this happened with HLN legal analyst Nancy Grace. Dan says, “I think now the question is what does Juan Martinez, the prosecutor, do? You have a divide on this jury, according to the Arizona Republic and others, of 8 to 4, meaning there were 4 people who were holding out for life – not one, not two. That says to me that it is time for Juan Martinez to try to cut a deal here for life without parole. On the one hand, it ends this, and on the other hand, it ensures that Jodi Arias would not get the opportunity for parole.” Nancy, of course, disagrees with Dan. To find out why, watch the video here.